Surprise your beloved mother this Mother's Day with our specially made Rose Mousse cake! Sakura soft sponge with Chantilly cream. Japanese light cheese cake with green tea flavour. Only available until end of April. Soft sponge with fresh cream and sliced strawberries. A popular Japanese-style "strawberry shortcake". Sponge With Fresh Soft Cream, sliced ​​strawberries A Popular Japanese-Style "Strawberry Shortcake". Japanese light cheese cake with fresh strawberries decoration. With lots cake with fresh strawberries in a light taste of cheese cake. Soft sponge with chocolate cream & sliced strawberries. Chocolate version of strawberry shortcake. Soft sponge with chocolate cream, sliced strawberries & seasonal fruits. Chocolate version of strawberry shortcake. Rich chocolate sponge with chocolate ganache. Especially wonderful for chocolate lovers. Chestnut cream atop the layers of puff pastry, layered with fresh cream, custard cream and sliced ​​chestnuts. Mont blanc chestnut cream atop with soft sponge and chestnut inside. Chestnut cream atop with chocolate sponge and chestnut inside. Chocolate sponge custard cream, is our most popular decoration cake that concealed the puff pastry. Raspberry jam atop the layers of puff pastry, layered with fresh cream,soft sponge, sliced ​​strawberries. Green Tea sponge cake with green tea cream. Hall cake piled powdered green tea cream tea cloth. Decorate birthday cake for your special one. We have the 寿topper for you. Using Rice gelée from Japan which is made with only rice and water, as the main ingredient. Enjoy its mocha-like texture the will make you crave for more. Buy 5 get 1 Free. One of each flavors in box. Two layers of soft sponge with fresh cream and sliced ​​strawberries. A popular Japanese-style "strawberry shortcake". It is a typical strawberry short cake of Japan. Rich chocolate sponge with chocolate ganache. Specially for chocolate lover. Japanese light cheese cake with fresh strawberries. Raspberry jam atop the layers of puff pastry, layered with fresh cream, sliced ​​strawberries and pineapples. Mille feuille of strawberries. It was concealed pineapple accents. Purple sweet potato with our signature almond tart base. Almond and walnut with nougat tart base. Butter cookies with almond flavour. Crispy cookies with coffee flavor. Crispy cookies with Vanilla flavour. Crispy cookies with Healthy walnut flavour. Soft and tasty tea cake. Chocolate flavour of tea cake. Butter and almond tea cake. Longevity in Chinese, 寿 "Shou" wording hand-drawn onto a chocolate plate together with a written message. *Image shown is an example. *This is an add-on. Please choose the cake flavour under the Whole Cakes section. Any image can be printed on icing paper (edible), with a chocolate base placed on the cake. Kawaii edible animal sugar dolls. It can be place on the cake for decoration. -Use only under close adult supervision. -Please keep away from kids. -Do not hold in hand. -light tip and get away. -if using indoor please be careful and keep away from flammable times. Celebrate with champagne candles that are sure to fizz out any party! Blow them out, then open the real champagne! Vroom! Drive your friends happy with this delightful sports car candle! Celebrating a child's birthday? This candle is definitely something to delight any kid! Beep! Beep! 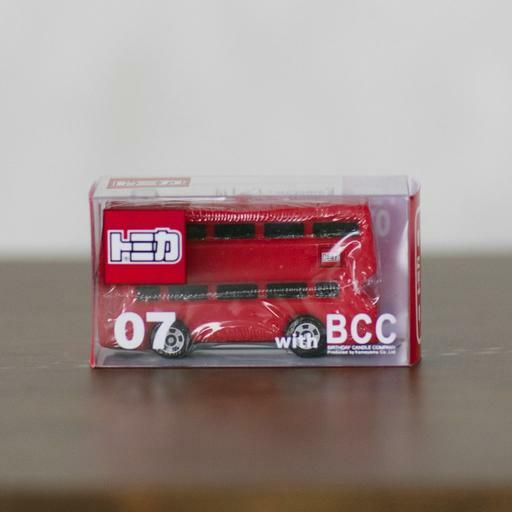 The red London bus is sure to look cute on any cake. But don't go off anywhere till you've finished the cake! Shinkansen candles for that friend who's always on the move! Cute birthday figures that add a dash of aesthetic excitement over traditional candles! Perfect for fans of the beloved Japanese anime series, bring a smile to their faces at any celebration! Who doesn't know the famous Ultraman? Delight any comic and anime fan out there with this classic character sitting atop their cake! Cute Omedetou candles that are both amusing and aesthetically cute! Cute wedding figures that add a dash of aesthetic excitement over traditional candles! Celebrate any wedding with this cute couple candles! Japanese Home-style dishes for family and friends.